Can you really imagine a world with rules? Any speed on the highway, any side of the road you want. Punch the clock for work any hour you please. There would be no tests at school (if you actually went ). Everything would be free at the store (if the owner actually decided to go to work that day, or the supplier brought produce...). Can you see where this is heading? The world would be chaos. Everyone doing what they wanted and nothing actually getting done. Rules provide boundaries. Boundaries provide security. Security will lead to confidence. Not the smothering security of no risks, but the enlarging security of providing the tools to deal with risk. The world of the horse is similar. Even in the wild there is structure to their life. Someone, a stallion or lead mare, is in charge. Not someone merely proving wants and needs but someone responsible. Their lives are not free from danger. Their lives have been lived to deal with risk. Yet they survive. Horses in domestic situations are asked what they would like to do. Would you rather eat or be ridden? They are allowed to run in and out of “structures” as they please. 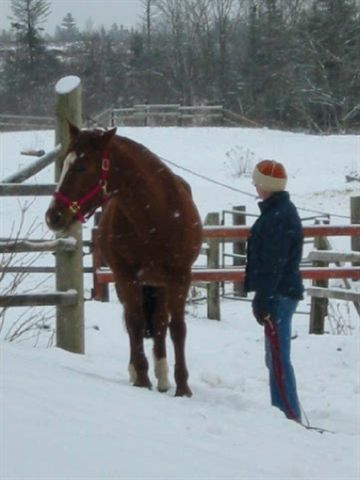 “My horse is so smart he runs right to his stall for his feed and then out again as soon as he is done. I just make sure I stay out of his way.“ They are placed in open concepts with the thought of openness meaning freedom and freedom meaning contentment. “Horses are social animals, so he needs to see everything around him; so all our stalls have bars, not walls”. Not many horses are leaders. Most are followers. Allowing them ,or forcing them, to live in situations for which they are not equipped ,can be very traumatic. It actually can keep them very immature and nervous. Wild horses choose their buddies, they are not forced into relationships with strangers. (Please do not walk up to every horse and assume they like you to pat them on the nose or grab their halter). They should have room to escape if necessary, but choose to stay if a trusting bond is there. Behaviour that harms the group as a whole is strongly discouraged. Bullying, pushing, biting, kicking are not acceptable to leaders. Leaders are servants who KNOW, really KNOW what is good for those over which they have charge. But I want him to LOVE me! Rules will make him fear me and I love him so much. Love has many roles. One is to protect ,and another is to equip what we love to be a functioning , positive influence in the world. Rules allow both. We should not let our need of acceptance and immediate comfort over ride the good of the horse. Good Training or Good Nature?